Get your spot on the Southern Empress, a 19th Century riverboat departing for short dinner and drink cruises on Lake Conroe. Sailing from the Sunset Harbor Resort on Saturday evenings, Southern Empress Cruises offers a chance for you to enjoy a three-hour dinner cruise or cocktail cruise on Lake Conroe. Currently, the Southern Empress offers both dinner cruises and cocktail cruises every other week, alternating from one to the other every Saturday. 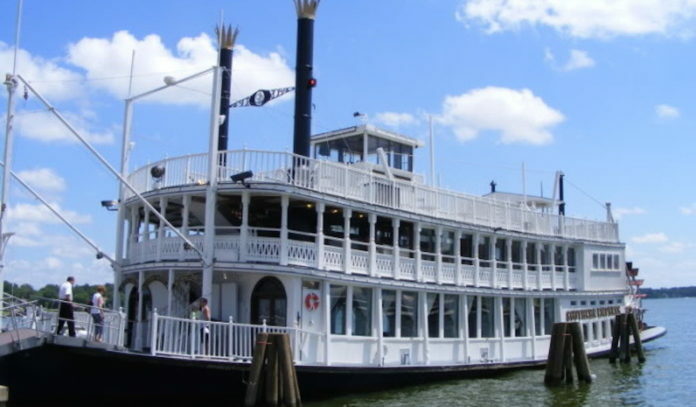 The Houston Dinner Cruise sets sail in the evening, on Fridays and Saturdays and includes full meals, featuring “good ole’ down home grub” as an entree, a salad, drinks, and a dessert. The dinner cruise lasts for three hours and offers an unique experience every time. A Luncheon Cruise is also offered once a month, during the weekday, for those who want to enjoy the lake during the day. The Cocktail Cruise happens on Saturdays, sailing from, 9:30pm to midnight, with drinks available-for purchase. You can check the cruise calendar for the season’s schedule. At both the Houston dinner cruise and cocktail cruise, a live cover band plays classic tunes of the ’60s to the more recent pop hits of today. Patrons often take to the dance floor after dinner or drinks or also explore the upper, outdoor deck and take in the lake air and forest views. The ship is a recreation 19th Century sternwheeler riverboat, although the inside decks boast modern air-conditioning and facilities, the decor is decidedly Victorian, including large chandeliers, embossed tin ceilings, brass accents and an old-timey bar. Built in 1983, in a Mississippi shipyard: the 131-foot paddle-wheeler, was cut into sections; then transported by 27 semi trucks to the captive waters of Lake Conroe, at Seven Coves. There the craft was reassembled, finishing touches were added, and it was launched as one of the Lake Conroe’s most recognizable fixtures. Times: Cruise schedule vary by month, typically with Dinner on the Lake taking place on Fridays and Saturdays, Cocktail Cruises taking place on Saturdays, and Luncheon Cruises taking place once a month on a weekday. Click here to check the cruise calendar. Tickets: You can call Southern Empress Cruises directly at 936-588-3000 or click here to book your cruise online.